Ok what I want to know is how much is too much? I have some factory loads and some hand-loads. 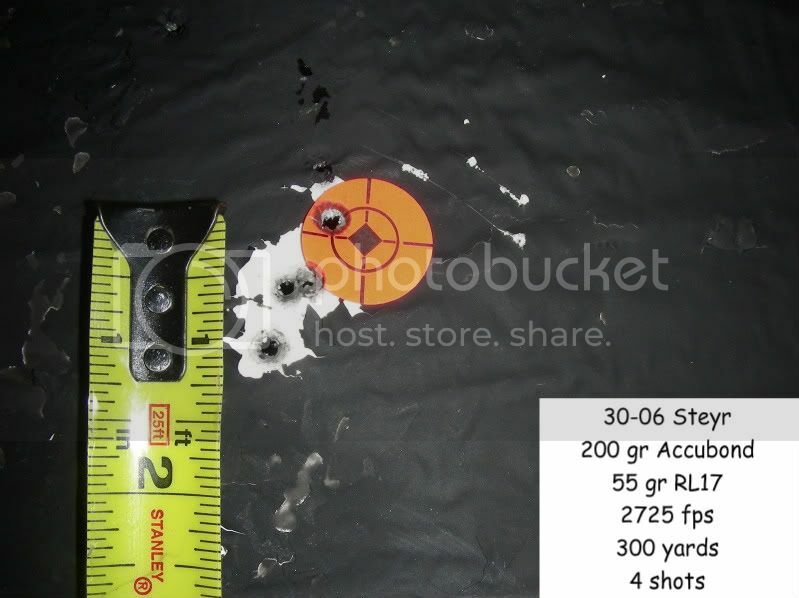 The hand-loads are pretty mild, the amount of bulge in them compared to the factory loads is pretty much the same, but then what do I know about it? Is there an amount of bulge that is too much? The factory loads are Rem. and the new brass is Win. 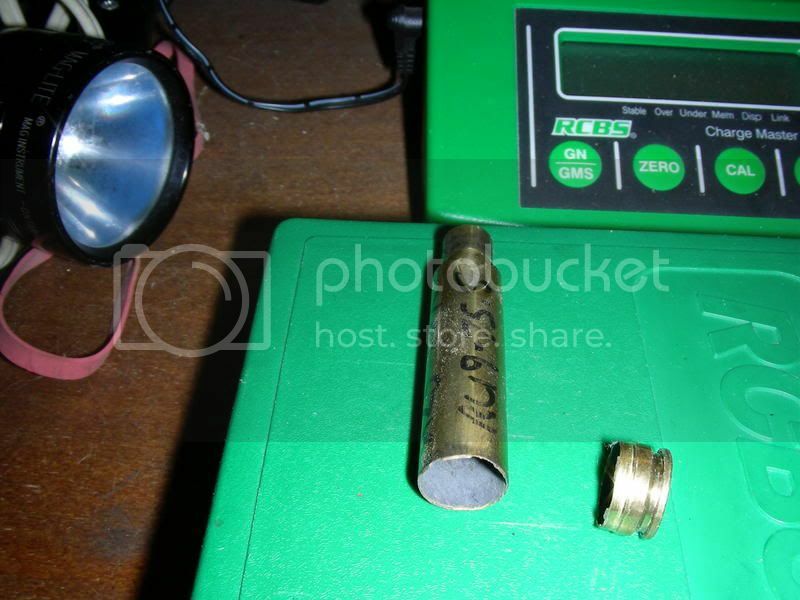 My measurments may be a little off compared to the photos because I can't see the photos so I'm measuring some brass in my hands as I'm typing this. So it's not that I haven't seen bulges in brass before but it's never been an issue that I can find any info. on. How much is too much? as long as the bulge is above the web just chalk it up to chamber dimensions. The critical measurement is on the web and if you get even .001" there it can mean too much pressure. 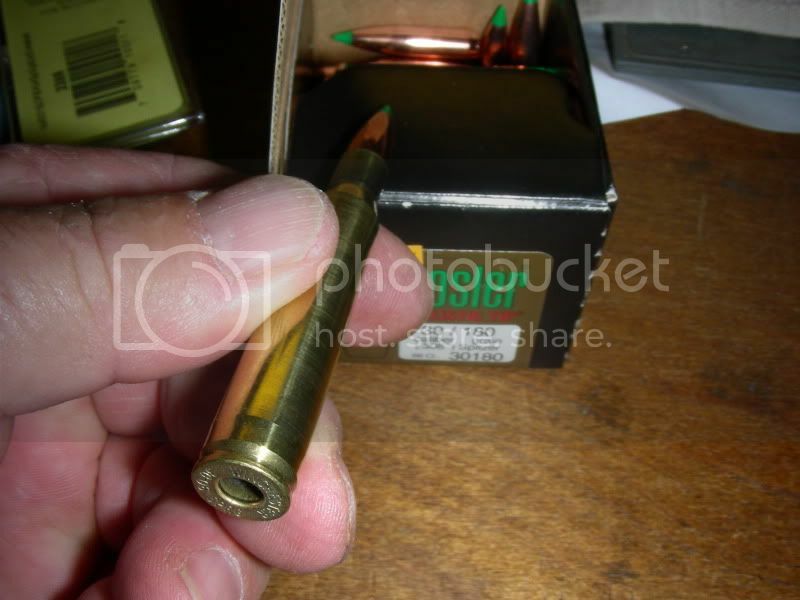 My 3006 has always had bulges like you show and I used to full length size to get rid of it but found that after 8 or 9 loadings the cases were having "J" splits where the brass was being worked so much. 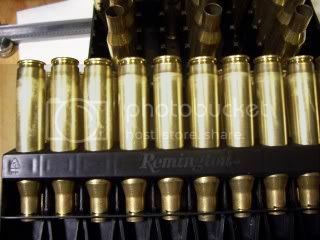 Since I have been neck sizing only my groups got smaller (size does matter) and the cases are lasting well into the thirty range for number of reloads. Suz, do the primers come out a little? 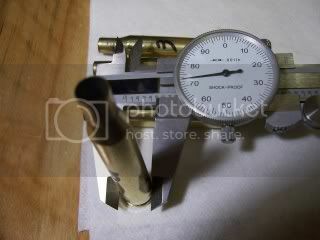 Is there a difference between a fired and an unfired shell when you measure from the footh till neckcurl? I had the same on my self-made .270 and put the barrel on the lathe and made the chamber a little shorter... and still my brass did split. 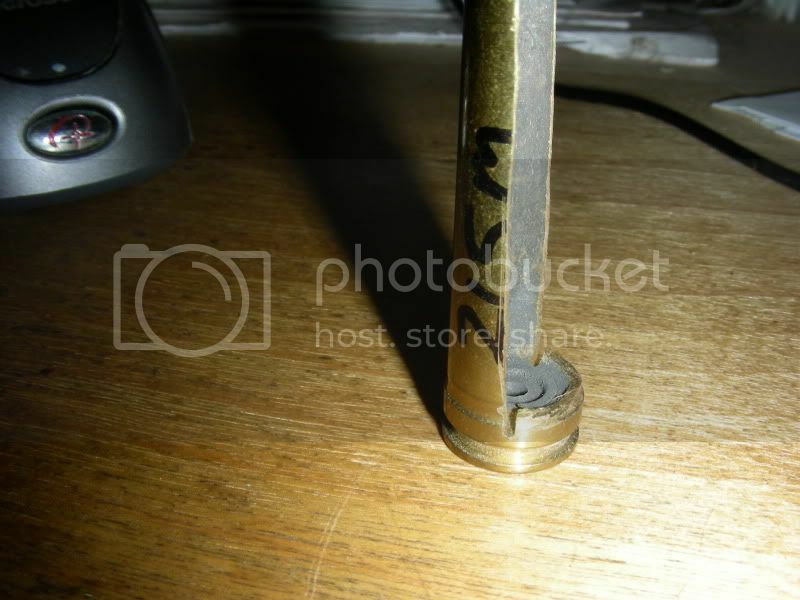 Then I placed my first die about 1 mm above the shellholder and started necksizing like this (as Paul suggested) and the brass remained OK (and groups really got smaller). So the cheapest test to do: turn that 1st die up for about 1 mm, make a few rounds and see what happens. Its o.k. suz what paul s said was spot on. Let me add I believe manufacturers of components make this stuff a little under-sized to fit even the tightest chambers or autoloaders that are are kinda dirty. So as to make their product more "universal". If you look at a chamber drawing it will have a deminsion very close to .473" in that area. now having said that if you look at a cartridge drawing it will be smaller. it is important to know which one you are comparing to. That has nothing to do with your question but I thought you might get there pretty soon so I threw in a freebee. Hey FN!! All that and you're not even wearing a cowboy hat! Thank you I was wondering about how the chamber was dimensioned, you would think it would be closer to the un-fired state of the brass. Thanks for the free-bee makes me wonder what you would normally charge. Have a cold one, on me. I have some old hats, believe it or not when I first mustered out, i earned a living in a horse barn. my newest black stetson is from their dress catalog, what i used to call the old man hats. OK! you crack me UP! You need a new avatar on here with the old man hat! the advantage is that your die will be sure and size the pressure ring. IOW I have a custom tight chambered gun where the die will not size the pressure ring and the case gets tight and drags in the chamber after 3 firings. The only fix is to get a custom die or find one that has smaller interior dimensions. Woods!! Hey thanks for the cut-away view! I've been looking at other information on forums and other places about the pressure ring and it's expansion. One of the best explanations I found was the likeness to it being like blowing up a balloon. Once you get past the initial elasticity of the rubber, it's easier to blow up the balloon, but the material is also thinner and weaker. 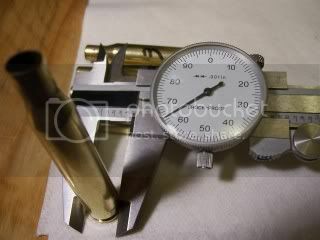 I can understand why full-sizing the brass is like working the bulge back and forth and weakening it that way, but doing a neck sizing only, you will be keeping the pressure ring and, during the next firing, the chamber dimensions will keep the brass from expanding farther. I would just think you'd get a stuck case, it would expand and not contract after a while because of the thinness of the brass. Maybe I'm just thinkin too much.. The problem does not come from the expansion of the pressure ring to the chamber wall and being sized and expanding back again. When the primer fires it acts like a jet pushing against the inside of the primer pocket and sends the case to contact at the shoulder. Then the powder expands the case body to the walls of the chamber where pressure holds it in place and then the case head is forced back to the bolt face. The pressure ring brass thins from being stretched lengthwise. Think of it as holding a rubber band between your fingers of both hands with the entire length covered, now pull your hands apart and the rubber band stretches and thins at one point between your opposing fingers. There can be other reasons such as excessive head space on regular bottleneck cases or head clearance on belted cases. In that instance there is so much initial expansion linearly at the pressure ring when firing a new case that the case is predisposed to a separation. But sizing the case inward at the pressure ring does not create a problem. and that's why I recommended to turn your first die up till you have about 1 mm space between die and shellholder, a kind of necksizing for poor guys and girls that works quite well. 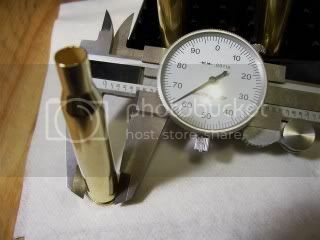 And for your info: 25,4 mm give 1"
Doesn't seem like 1mm would be enough, I'll give it a try, even though I ordered a neck sizing die for the .270 I have other calibers I can try it on. Save me some money tooooooo. Thanks guys!!!!! Normally 1 mm space between shellholder and die is enough for necksizing, you can do more but then you also have to adjust (lower) the pin that's pushing the old primer out. Just measure the distance between footh and shoulder which should be the same before and after resizing. And when you really want to start as a pro, don't only look at the distance between first die and shellholder, but also measure the neck and adjust the distance between die and shellholder till about 80 % of the neck is resized. The last 20 % is your indication that you didn't touch the shoulders + it will help to secure the bullet when you don't use a crimpdie. Maybe better so: the lower 20 % of your neck (not yours of course but the neck of the cartridge!) should remain looking "potbellie", then you know you didn't touch the shoulders and you performed a very nice 80 % necksizing.